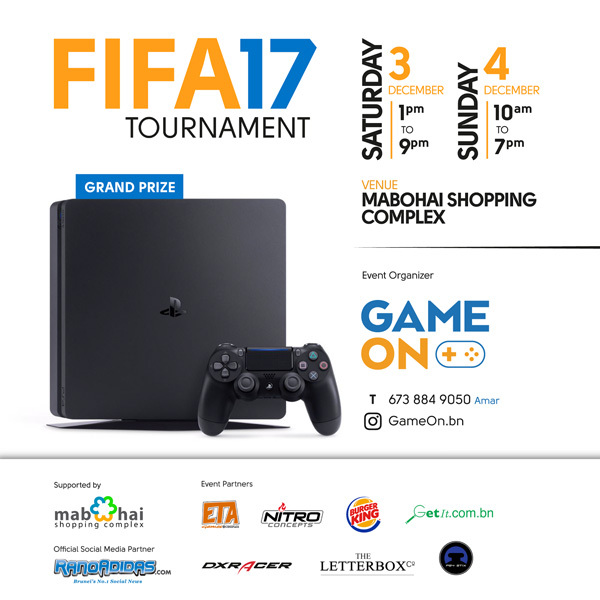 Game On Business Management & Services (Game On) brings you the very first PS4 FIFA 17 Tournament from the 3rd to 4th December 2016, at Mabohai Shopping Complex. If you’re up for the challenge, register now until 3rd December 2016 by providing your Full Name, Contact Number and choice of session along with an entry fee of BND20. Each player will be entitled to a free drink & fries, courtesy of Burger King Brunei. The winner will walk away with the grand prize of a brand new PlayStation 4 Slim (500GB), a PS4 Stix Gift Voucher and Game On merchandise! Qualifying rounds will start on Saturday from 1pm to 9pm and on Sunday from 10am to 4pm. Knock-out rounds will be the last 32 players to the final starting from 5pm onwards (Sunday). This event is brought to you with the supporting partners of Mabohai Shopping Complex, ETA Games @ Cineplex, PS4 Stix, Get It Enterprise, Instrutech Engineering, Burger King Brunei, and The Letterbox Co. The Official Social Media Partner for this tournament is RanoAdidas. Game On Business Management & Services is an event managing company dedicated to organising video game tournaments in Brunei Darussalam, established in 2016. Check out Game On’s official Instagram @ GameOn.bn for latest updates and more cool stuffs!